With five distinct majors, the Department of Kinesiology has a long history of success and centers learning around a calling to care for others. Kinesiology is the study of human movement and its impact on people’s health and quality of life. Those who pursue a degree in the area of kinesiology go on to a diverse range of interesting careers, all centered on caring for others. The Department of Kinesiology is committed to to the personal and professional development of students, helping students fulfill their calling in life. We believe this occurs through the fulfillment of 1 Peter 4:10. Each one should use whatever gifts he has received to serve others. We believe in treating the person not the condition; that each of us has the capacity to serve. We believe that everyone have the ability to use our skills and knowledge to improve the lives of people in need. It’s important that we use these gifts to make a difference in the lives of the people in our care. This distinctive prephysical therapy major was created specifically to prepare you for a Doctor of Physical Therapy program. Our interdisciplinary approach incorporates classes such as nutrition, biology, physics, athletic training and chemistry to ensure that you are prepared for whatever comes next in life. Majoring in health sciences allows you to explore the various professions within the broad area of health. Whether you are interested in becoming a physician assistant, an occupational therapist, a strength and conditioning coach or other health professional, the health sciences major provides many elective hours to allow you to tailor your program to meet your professional goals. If your calling leads you to the world of sports, a degree in sport administration will prepare you for leadership at almost any level of the industry. In addition to giving you the knowledge and experience you need to excel on the business side of sports, we see the degree as a kingdom calling—an opportunity to serve as a Gospel witness in the sports world. Answering the call to join the medical profession means dedicating yourself to helping others lead better, healthier lives. In the sports medicine program, you will build a foundation for professional success, whether you go on the medical school or another professional track. The minor in sport and recreational ministry is intended for individuals who want to use sport and recreation as a platform for ministry in a church or parachurch settings. A collaboration with Upward Sports, the goal of the program is to train professionals who want to use sports as a platform for ministry; it’s ideal for any student who has a passion for both sports and Christ. The fast-track program provides students the ability to earn both a bachelor of science in health science and a master of athletic training in only five years. Earn a major in Exercise Science and a Doctor of Physical Therapy is just six years. Incoming freshmen may apply for the program and must meet specific progression standards to remain in the program. Acceptance to the fast track guarantees admission into Samford's D.P.T. program as long as progression standards are met. When educating skilled caregivers, there is no substitute for hands-on clinical experience. Not all degree programs include a clinical component, of course, But for those that do, we give students every opportunity to learn by doing. For those programs in the Department of Kinesiology with a clinical component, students gain practical experience in a number of settings. Birmingham is an exceptional place to learn. For graduate and undergraduate students doing clinical work locally, few places offer more opportunities than Birmingham. We are surrounded by some of the finest health care facilities in the world, from acute care to specialty clinics. Because Samford has earned an excellent reputation in the health care community, you’ll have opportunities to learn from some of the most skilled health care professionals in the world. Because we believe so strongly in the value of hands-on experience, you will complete more hours of clinical work than in most other programs. All students in the Department of Kinesiology are required to conduct a year-long research project during their senior year. Our past graduates have created projects that won awards at national, regional and state research competitions, have been published in peer-reviewed journals and have been presented at professional conferences from the state level to the international level. Scholarship applications in the Department of Kinesiology are available annually in mid-March, the deadline is early April and students are notified of awards in mid-April. All students enrolled as majors in the department are eligible but priority is given to those students who have been students in the department for at least one year. This scholarship is available to students in athletic training, exercise science, fitness and health promotion, sport administration and sports medicine. Selection of this scholarship is based on a clear commitment to the profession related to Kinesiology, financial need, career/vocational goals and academic achievement. This scholarship is available to students in sports medicine and exercise science. Selection is based on financial need, involvement in the departmental major's clubs and professional associations, academic performance, career/vocational goals and other scholarships or grants awarded. In the Department of Kinesiology, we are called to nurture and prepare students to positively impact the health and well-being of members of society and to instill in all students, faculty and staff, a commitment to lifetime fitness and positive health. An exemplary education provided in a Christian context, by individuals with a demonstrated commitment to excellence in scholarship, service and teaching provide the mechanism to fulfill this mission. The vision of the Department of Kinesiology is to challenge students continually to improve the health and well-being of society by exhibiting the highest standards of quality in teaching, scholarship and service; and to assume the leadership role among undergraduate academic programs in our field in meeting the challenges of preventive medicine and health care. Collaboration: The phrase “to act as a unit” forms the basis of the Department of Kinesiology. This value ensures that all students will benefit from the collective wisdom of a team of education professionals. 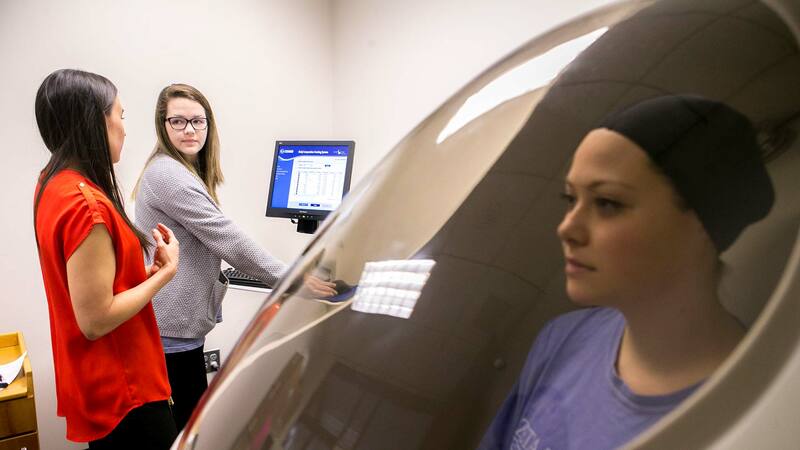 Excellence: A commitment to excellence has created the Kinesiology Department’s legacy of achievement and innovation in curricular and programmatic areas resulting in high achievement for students and faculty. Integrity: Adherence to scientific, professional and personal integrity are our ethical cornerstones; they underlie our desire to mentor students, conduct clinical research investigations, educate students and allied health professionals, while guiding the fiscal and administrative management of the Kinesiology Department. Compassion: A commitment to compassion includes respect for all persons, while providing the highest level of service. Commitment: As an institution, the Kinesiology Department recognizes its responsibilities to the community in which we reside, to the students it services, to Samford University and to the individuals in leadership who oversee the management of its resources.